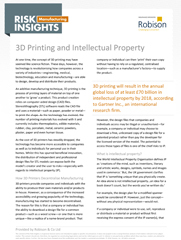 Professional printers can face any number of risks, from loss of artwork and rectification costs, to loss of stock and computer and machinery breakdown costs. 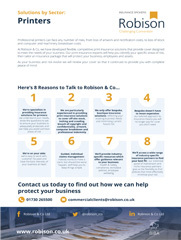 At Robison & Co, we have developed flexible, competitive print insurance solutions that provide cover designed to meet the needs of your business. 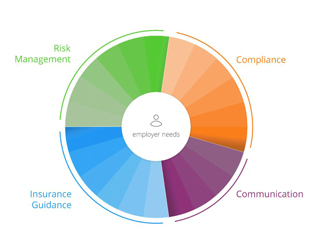 Our print insurance experts will help you identify your specific areas of risk, then tailor an insurance package that will protect your business, employees and assets. As your business and risk evolve we will review your cover so that it continues to provide you with complete peace of mind. 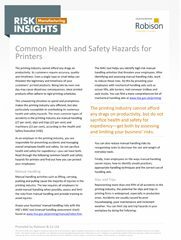 We’re specialists in providing insurance solutions for printers: we understand your needs, know the questions to ask to ensure your business is adequately protected, and can help you avoid common areas of risk. 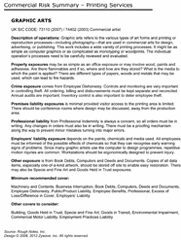 We are particularly experienced in providing print insurance solutions to cover off-site stock, inching and crawling, breach of copywrite and confidentiality, artwork, computer breakdown and professional indemnity. 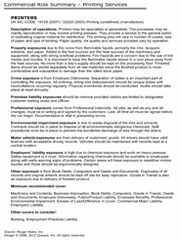 Every one of our client’s requirements is unique, but here are a few of the specialist insurance policies available to printers. If you’re interested in learning more about insurance cover for printers and how we can protect your business, please give us a call on 01730 265500 or email one of our Print Insurance specialists, Simon Gubbins or Danny Toull.